Time for another little snippet from the current issue of Proper, this time an exclusive chat with legendary Barbour Beacon (aka TO KI TO) designer Tokihito Yoshida. First question, what are you wearing today? As I went out on my bicycle, I had my Bicycle jacket on from the Beacon Heritage Range in Barbour wax cotton. I also wore a vest from my TOKITO collection, which is made with British tweed from Johnston, plus some chino pants. You started the Tokito brand in 1997, how and why did this happen? I started my own company with my personal investment because I wanted to make clothes without any restrictions. Before that I did a lot of different work, but I wanted to concentrate on designing so I started TOKITO. I also met a very capable patterner, which gave me confidence to start the brand and we are still working together. How did you become involved with Barbour? The WP Lavori company in Italy (Barbour’s distributor) saw the TOKITO collection and asked Barbour if I could supply designs. When I was working on the first collection, Barbour proposed that it was called the Beacon Heritage Range designed by Tokihito. What does the brand mean to you and how is Barbour perceived in Japan? To me, the brand is like myself, I think. I believe that Barbour’s heritage has developed through it’s long history to create the brand itself. 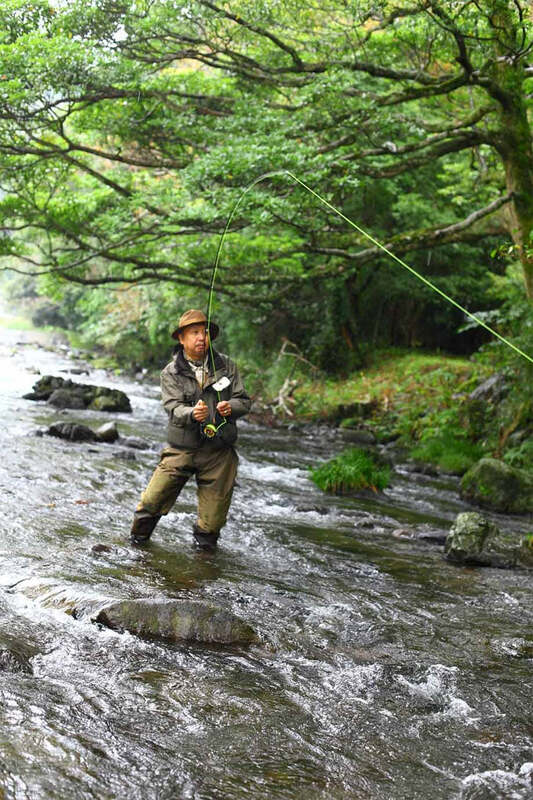 Barbour is perceived and understood in Japan as a traditional, elegant brand with real status. For menswear, it’s very masculine and designed for gentlemen. What are your key considerations when designing a collection? The most important thing is that the design lives up to Barbour’s tradition and uses functionality as a tool. The design that expresses the silhouette must be British. The style also needs to have freshness mixed with modernity. Lots of images are taken from First and Second World War military wear. There is also lots of inspiration from outdoor clothes with functional garments made for mountains and oceans. Equally garments from Savile Row can inspire too. When you’re designing, what kind of person do you have in mind as wearing your designs? Basically I want to wear all the clothes I design. I always imagine myself wearing them which invests more of my personality into the design. Apart from being incredibly skilled, why do you think that Japanese designers are so highly revered in the West? Our Japanese clothing culture does not have a long history and has only recently started to have its own originality. Including me, many Japanese designers have been seriously studying the clothing culture and history from all over the world. Based on that knowledge, we have built our own style with a mixture or reconvening of the different styles and history. What about Barbour in the current season. Were there any particular styles of jackets you were keen to work on? Recently, I have designed a Spey Fly Fishing Jacket and Shoreman Jacket for the AW11 Barbour Beacon heritage collection. These models are be very important products for my personal weekend life. To read the full version of this interview, grab a copy of Proper Magazine Issue 11.